The new cooling tower upgrade in the Šoštanj power plant is progressing with innovative formwork solutions from Doka. 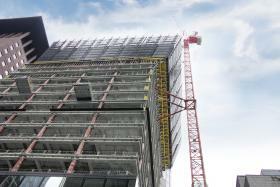 The high-performance cooling tower formwork SK175 is reliable technology in place to ensure speedy progress on site. The lignite-fired power plant in Šoštanj generates about one third of Slovenia's electricity and it is currently being upgraded in line with future challenges. The new 600 MW Unit 6 moves utility company and operator TES into the future of stable energy supply. Unit 6's cooling tower is the most prominent feature of the new power-plant infrastructure. 32 inclined columns carry the tower's outer shell. Beam formwork Top 50 is being used as large-area formwork on this build. H20 timber formwork beams and Dokaplex formwork sheets were the main component parts, combined as a versatile and speedy solution for the first phase of construction. The bottom ring was set up after the first columns had been cast. Doka's Ready-to-Use Service had this outer-shell first ring, measuring some 93 m in diameter, on site and waiting right on time. The cooling tower formwork SK175 is worked off this ring. Doka SK175 is automatic climbing formwork and on this build it was the key to speedy, safe and efficient progress on the 164.5 m tower. 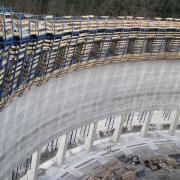 SK175 offers all the advantages of a fully mechanised, automatic climbing large-area formwork system. A total of 47 inside and 47 outside climbing units gave shape to the tower. These units enabled the build to rise at up to 1.5 m per day. The sections were cast in one-day cycles, so construction proceeded with the speed and safety inherent to a clearly structured routine. 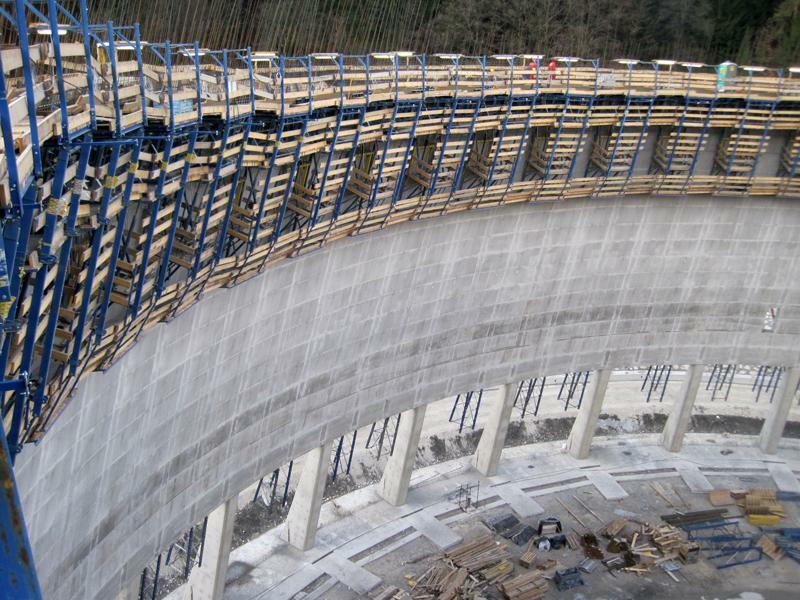 Integral ladder systems and formwork components fixed to the structure offer dependable protection even at high wind velocities and at dizzy heights. Thank you for your interest - Safe and sound. Thank you very much for your interest - Safe and sound.